What a charming book! 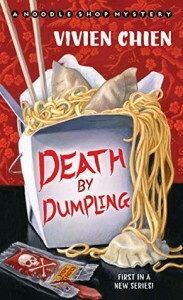 This will definitely appeal to any cozy mystery reader, but I can see it being a hit with younger readers (and by younger, I mean younger than my creaky middle aged bones! Young people in their 20s or perhaps even teenagers (there's no bad language or sexual situations) would really like this.) With a sprinkle of romance, a bit of intrigue, adorable characters, a cute setting and a captivating mystery, what more can you ask for in a cozy? The Asian venue was a fresh and unique setting for the mystery. This isn't your average everyday cozy! I loved Lana and her roommate Megan, they made a great team and their enthusiasm caught me up and rolled me right along with them. The cute Asia Village plaza with its Chinese shops sounds like such a great place to visit and browse for a day. Is this a real thing? Is there an Asia Village I can visit somewhere? Hmmm. And the plot! All the twists and turns and red herrings kept me guessing and I was completely turned around upside down by the time I got to the exciting ending. Can't wait to read more from Lana and the gang!